Scholastic On-Line Book Fair Oct. 22 – Nov. 9th – If you’re all booked up during Book Fair week (or just want to keep shopping), be sure to visit the Book Fair online at http://www.scholastic.com/bf/cheyennems. The online Book Fair is available for an extended time from Oct. 22 – Nov. 9th. Scholastic In-Library Book Fair Oct. 29 -Nov. 2nd – Join us Monday – Thursday from 7:50 AM – 2:40 PM and Friday from 7:50 AM – NOON to purchase your favorite book fair goodies! Pumpkin Decorating Contest Oct. 23 – 26th – Bring your book-themed decorated pumpkins to the library by NOON October 27th. For all the rules and regulations please refer to the flyer. Due to issues with rotting, absolutely NO carved or punctured real pumpkins. 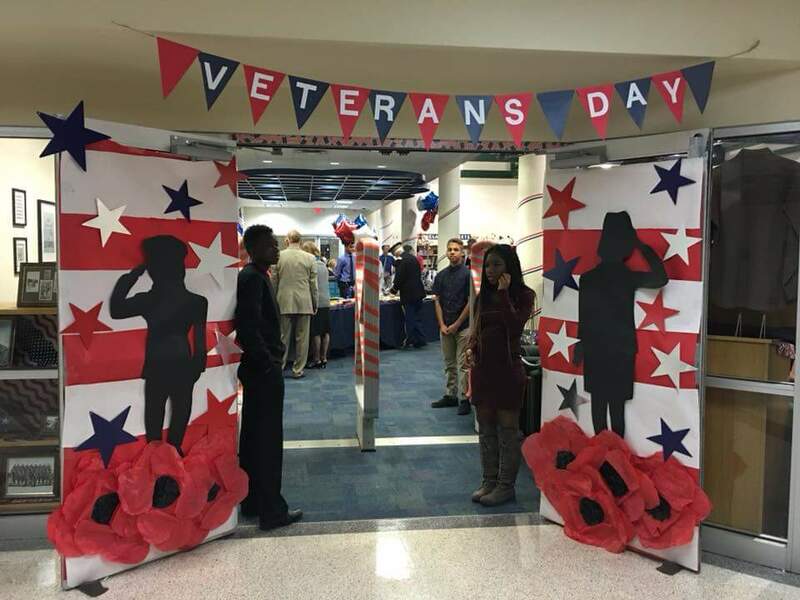 Veteran’s Day Celebration – Nov. 9th – CMS 8th-graders will be celebrating those who serve or have served our great country on November 9th. A reception for veterans will begin at 12:30 PM followed by an assembly from 1:30 – 2:30 PM. The veterans in attendance are all relatives of our 8th-grade students. Guess the Teacher’s Pet Contest – Jan. 8 – 18th – The Guess the Teacher’s Pet Contest is going on January 8th through NOON on Tuesday, January 15th. Remember you can only vote by completing the form one time and one time only. The Guess the Teacher’s Pet photos are on display in the Media Center. Stop by today to vote. Winners and prizes will be announced on January 16th! April Henry Author Visit – Feb. 1st – Cheyenne Middle School is excited to welcome author April Henry! She will be sharing her experience as a best-selling author with the 8th-grade students Friday, February 1st. If you’d like to buy a book and have it autographed, complete the form available in your English teacher’s classroom, and pay with cash or check (payable to Best of Books) by January 23rd. The Night She Disappeared and The Girl I Used to Be are available for the low, low price of $11 each. Her newest book, The Lonely Dead, is available only in hardback for $18. Place your order now! Blind Date with a Book – Feb. 11 – 22 – Do you judge a book by it’s cover? Try a blind date with a book. These books are single and ready to mingle, and we’re only letting you judge them based on a few keywords. It’s About Trying New Things. Stop into the Media Center starting Feb. 11 to check out a blind date book, take it home, and unwrap it. Show it your favorite spots to read. Get to know each other. If you hit it off, introduce it to your friends! First, a few ground rules…If you take a book and open the package you are committed to reading the book and cannot return it within 24-48 hours, but all books are due within the normal two weeks checkout period. After you’ve had a proper date with your book, return it directly to Mrs. Whitmarsh or Mrs. Neff and receive a Rate Your Date form. We’d love to know if your date was a success or a flop! Cheyenne Book Madness – Feb. 25 – Mar. 29 – Students voted for their favorite Cheyenne Book Madness titles each week during homeroom class times. Spring Book Fair – Apr. 22 – 26 – Want to get stocked up with books, games, goodies, and more for some summer reading fun? Check out our selection here. Origami Tsunami Club – First Thursday of Month -If you like to create origami, meet at the Edmond Public Library the first Thursday of every month! The club meets from 4 to 5:30 PM. Author, Marie Lu – Sept. 21st – Come check out the author of the Legend series and the Warcross duology at Best of Books starting at 6 PM. Author, Naomi Hughes – Oct. 6th – She will be signing copies of her new book, Afterimage, on Saturday, Oct. 6 from noon to 1:30 pm at Best of Books. Oklahoma Book Festival – Oct. 20th – Want to meet a bunch of authors all in one place? Meet us at the Oklahoma River for a fun-filled day celebrating the written word. The 1st annual Oklahoma Book Festival will take place at the Boathouse District in Oklahoma City from 10:00 AM to 5:00 PM. October YA Booknerds – Oct. 20th – The YA BookNerds are a 12+ ONLY club (adults welcome) that meets the third or fourth Saturday of every month at the Edmond Public Library. There are three book selections each month and members read at least one before joining in the discussion. Middle-Grade Author Panel – Mar. 9th – Kim Ventrella, Brad McLelland, and Melanie Sumrow will be signing books and answering questions at Best of Books @ 1PM March 9, 2019. Lisa Graff Book Signing – Mar. 13th – Come join us at Best of Books Wednesday, March 13th @ 6PM to hear all about Lisa Graff’s newest book, Far Away. Teen Fiction Writing Workshop – Mar. 21 – Best of Books and SCWBI Oklahoma is sponsoring a Teen Fiction Writing Workshop for 12 – 18-year-olds. It will be hosted by the legendary, Jennifer Latham. The cost is $25 and registration is required. Register online at http://www.bestofbooksok.com. Nathan Hale Book Signing – Mar. 27th – Nathan Hale has done it again! Come learn about his newest graphic novel, Apocalypse Taco at Best of Books on Wednesday, March 27th @ 6PM. This page is continuously being updated, so please check back often.